Draft: 2011, Pittsburgh Pirates, 5th rd. Immediately after the 2018 season ended, Tyler departed on a 17-day trip to Paris, Copenhagen, Prague and Amsterdam…he enjoys traveling alone and meeting new people, but flew his brother out for a few days to join him…a day trip to Karlovy Vary in the Czech Republic was the highlight…he's also been to Thailand, Greece and Germany and hopes to make international travel a yearly event...Tyler is a self-described "terrible" surfer but enjoys going, and went on a Mexico surf trip this offseason with his friends…he used to snowboard and skateboard as a kid...Tyler wears a size 16 shoe and opted for the nickname "Mini Horse" during Players' Weekend...Despite his 6'8" frame, executed a backflip to celebrate the start of spring training...His mother, Donna, was a gymnast at Cal State Fullerton, then coached Cal State Northridge to a Division II national championship in 1982...Graduated from William S. Hart (Calif.) High School, which also produced former Rays pitcher James Shields, though Tyler has never met him… Trevor Bauer, Mike Montgomery, Pat Valaika and Bob Walk also graduated from there...Grew 11 inches between his freshman and senior years in high school and separated a growth plate in his right shoulder in the process…was not in his high school rotation until midway through his junior season. Made 11 starts with the Rays after being acquired from the Pirates at the non-waiver trade deadline, along with outfielder Austin Meadows and a player to be named (righthander Shane Baz) in exchange for Chris Archer…made 34 apps with the Pirates, all in relief...Allowed 1 run or fewer in five of his 11 starts with the Rays…yielded 3 hits or fewer in six of his 11 starts and 2 hits or fewer in 5 starts...According to StatCast, averaged 96.5 mph on his fastball after the trade…his max velocity with the Rays was 100.2 mph in his start on Aug 7 vs. BAL...After making his Rays debut on Aug 1, his .208 opp avg. ranked 6th in the AL (min. 50 IP)…recorded a 3.07 BB/9 IP ratio with the Rays, down from 5.46 in 34 apps with the Pirates...Received a combined 15 runs of support in his 11 starts, including 2 runs or fewer in 9 starts, 1 run or fewer in 6 starts and no run support in 4 starts…min. 50 IP, his 2.43 R/9 IP of support was 2nd-lowest in the AL from Aug 1 through the end of the season...Allowed 13 SB in 16 attempts with the Rays… his 13 SB allowed after Aug 1 tied TOR Ryan Borucki for most in the AL...Went 0-2 with a 7.41 ERA (17-IP, 14-ER) in 4 starts against the Blue Jays compared to 1-3 with a 2.79 ERA (38.2-IP, 12-ER) in 7 starts against all other opponents...Was the fifth pitcher in club history standing 6'8" or taller, according to Baseball Reference, following Jeff Niemann (6'9"), Adam Russell (6'8"), Mark Hendrickson (6'9") and Billy Taylor (6'8")...Excluding openers, was the first pitcher in franchise history to begin his Rays career with four consecutive starts of 3 hits or fewer…went 3 IP, 4 IP, 5 IP and 6.2 IP in these starts, transitioning from the bullpen...On Aug 1 vs. LAA, made his Rays debut, and it was his first start since Sep 13, 2017 at MIL…his only run allowed was a 1st-inning solo homer to Kole Calhoun, his second batter faced…was the first time in his career he allowed a homer on an 0-2 pitch…went 3 IP in a no-decision...On Aug 7 vs. BAL, recorded a career-high 9 SO, becoming the second Rays pitcher with 9 SO (or more) in an outing of 4 IP or fewer, following Scott Kazmir on May 17, 2007 vs. TEX...On Aug 31 at CLE, his only run allowed in a career-high 7 IP was a solo homer by Edwin Encarnación in the 7th inning…faced the minimum through 4 IP and did not allow a hit until a 2-out, 5th-inning single…became the fifth Rays pitcher to lose a start of 7 IP (or more) and 2 hits or fewer, first since Jake Odorizzi on May 29, 2016 vs. NYY…he was the first Rays starter to do this when allowing 1 run or fewer since James Shields on Oct 2, 2012 vs. BAL...On Sep 5 at TOR, lasted 0.2 IP, the shortest start of his career…excluding openers and injury-shortened starts, it was the shortest by a Ray since J.P. Howell on July 5, 2007 at BOS (0.2 IP)…yielded 7 runs, tying his career high, and allowed eight of his 10 BF to reach base…actually recorded the potential third out of the inning, but the batter reached on a third-strike wild pitch...On Sep 17 at TEX, recorded his first win with the Rays, going 6 IP for the longest scoreless start of his career…did not allow a hit until Isiah KinerFalefa singled with 2 outs in the 5th inning… both hits allowed were infield singles...At the time of the trade, his 72 SO ranked 3rd among NL relievers behind MIL Josh Hader (99) and COL Adam Ottavino (77), and his 19 relief apps of at least 2 IP were most in the majors. Was a member of Pittsburgh's Opening Day roster for the first time in his career...Made his first start in team's sixth game on 4/10 and suffered a loss to the Reds at PNC Park; walked five batters and gave up five runs in 1.2ip...Allowed six runs (four earned) and struck out a career-high seven batters in 5.0ip on 4/15 at Chicago (NL)...Trailed 3-0 after facing three batters, but rebounded to record his first Major League win (6.0ip/3er) on 5/2 at Cincinnati; also singled, walked twice and had three RBI at the plate...Became the first Pittsburgh pitcher since Al McBean in 1967 to record two walks and three RBI in the same game...Pitched a career-high 6.1 innings and gave up four runs (three earned) in a 6-2 loss vs. Milwaukee on 5/7...Won his second big league game on 5/18 vs. Washington (5.0ip/4r/2er)... Went 3-for-3 at the plate while giving up two runs in 6.0ip in a no-decision on 5/23 at Atlanta...Served as a pinch-runner on 5/29 vs. Arizona and again on 5/31 vs. Arizona...Surrendered three home runs and lost a 4-2 decision on 6/2 at New York (NL)... Was optioned to Triple-A Indianapolis on 6/10...Picked up the win in his first start with Indy on 6/15 at Norfolk (game 1); gave up two hits and one run, while walking four batters and striking out eight in 6.0ip...Whiffed 11 batters in 5.0ip of a no-decision on 6/20 vs. Toledo (5.0ip/2er)...Struck out 12 batters and gave up just two hits and no runs in 7.0ip on 6/26 vs. Durham (nodecision)...Won his second game while striking out 11 batters and giving up two runs in 5.2ip on 7/1 vs. Louisville...Went 2-0 with a 1.90 ERA (23.2ip/5er) and 42 strikeouts in his first four starts with Indy thru 7/1...Pitched 7.0 scoreless innings and did not walk a batter while winning a 6-0 decision vs. Louisville on 7/14; he also led off the bottom of the third inning with a triple...Was named International League Pitcher-of-the Week for the week of 7/24-30 after going 1-0 with a 1.35 ERA (13.1ip/2er) and 19 strikeouts in two starts...Tied career high with 12 K's on 7/30 vs. Pawtucket... His 140 strikeouts with Indy ranked third in the International League and were the most by a Tribe pitcher since 1989 when Mark Gardner struck out 175 batters...Racked up 140 whiffs in 93.1 innings pitched since joining the Tribe on 6/15, the highest number of Ks since that date in Minor League Baseball...His strikeout total -- despite missing the first two months of the Triple-A season due to being in Pittsburgh's rotation -- ranked third in the IL behind Durham's Ryan Yarbrough (159) and Brent Honeywell (152)...Suffered 2-0 loss (6.0ip/2h/1r/2bb/9so) in Game Two of playoffs on 9/7 at Durham...Was recalled by Pittsburgh on 9/10... Suffered loss in his start on 9/13 at Milwaukee...Made two relief appearances to finish the season (5.0ip/2h/3er/9bb/3so). Was named the Top Pitching Prospect in the International League by MLBPipeline.com at the completion of the season (second time in three years)...Tied for fifth in the league in strikeouts (133) and ranked fourth in walks (62)...Ranked first among Pittsburgh farmhands in ERA (1.93) and strikeouts (144)...Began season with Triple-A Indianapolis...Gave up three hits and one run in first start on 4/10 at Columbus; suffered a 1-0 loss...Struck out 11 batters and gave up just two hits in 6.0ip while winning first decision on 4/26 at Durham...Was named the International League Pitcher-of-the-Week for the period of April 25-May 1 after tossing 11.0 scoreless innings and striking out 18 batters while winning his two starts...Struck out a season high-tying 11 batters and tossed 7.0 scoreless innings in a no-decision on 5/7 vs. Louisville...Did not allow a run in three consecutive starts (18.0ip) between 4/26 and 5/7...Won three straight starts and posted a 1.65 ERA (16.1ip/3er) between 5/27 and 6/6...Struck out nine batters and allowed just two hits and no runs, but walked five batters and threw 95 pitches in 4.2 innings on 6/11 vs. Syracuse...Pitched 6.0 no-hit innings on 6/17 at Charlotte (six walks) and 7.0 no-hit innings on 6/22 at Gwinnett (five walks), but received no-decisions in both starts...Was selected to the International mid-season All-Star team...Was leading the International League in strikeouts (113) and was third in ERA (1.78) at the time of his first recall to Pittsburgh on 7/7...Made his Major League debut on 7/7 at St. Louis; opposed Adam Wainwright and lost a 5-1 decision (5.1ip/3h/4r/4er/2bb/5so) ...Also singled off Wainwright in his second at bat for first big league hit...Was optioned back to Indianapolis on 7/8 during the All-Star break...Gave up just two hits in 6.0ip, but allowed three runs and suffered a loss on 7/18 vs. Lehigh Valley...Was recalled by Pittsburgh a second time on 7/23 and made his second big league start that afternoon vs. Philadelphia; left the game in the fourth inning with right shoulder discomfort...Was placed on the 15-day disabled list on 7/24...Threw a 50-pitch simulated game at PNC Park on 8/9...Made rehab start with Double-A Altoona on 8/14 (3.0ip/2h/2r/2er/3bb/5so - 55 pitches)...Made his second rehab start with Altoona on 8/22 at Harrisburg (3.0ip/0r - 57 pitches)...Had his rehab transferred to Indianapolis on 8/26; made rehab start on 8/27 at Toledo (3.0ip/3h/0r/3bb/3so - 58 pitches)...Was recalled from his rehab assignment, reinstated from the D.L. and optioned to Indianapolis on 8/28 ...Was victorious in his final Triple-A start on 9/1 vs. Louisville (5.2ip/1er)...Was recalled by Pittsburgh a third and final time on 9/6...Made three straight relief appearances (7.0ip/2er) between 9/11-18...Tossed 3.0 scoreless innings of relief on 9/18 at Cincinnati...Received a no-decision in his start on 9/25 vs. Washington (3.0ip/4r/3er) ...Made his final start with the Pirates on 9/30 at St. Louis; surrendered just one hit (a solo homer to Jedd Gyorko in the third inning) in 5.0ip and suffered the loss. 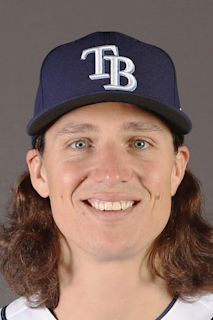 August 1, 2018 Tampa Bay Rays activated RHP Tyler Glasnow. September 10, 2017 Pittsburgh Pirates recalled RHP Tyler Glasnow from Indianapolis Indians. June 10, 2017 Pittsburgh Pirates optioned RHP Tyler Glasnow to Indianapolis Indians. September 6, 2016 Pittsburgh Pirates recalled RHP Tyler Glasnow from Indianapolis Indians. August 28, 2016 Pittsburgh Pirates optioned RHP Tyler Glasnow to Indianapolis Indians. August 28, 2016 Pittsburgh Pirates activated RHP Tyler Glasnow from the 15-day disabled list. August 27, 2016 Pittsburgh Pirates sent RHP Tyler Glasnow on a rehab assignment to Indianapolis Indians. August 14, 2016 Pittsburgh Pirates sent RHP Tyler Glasnow on a rehab assignment to Altoona Curve. July 24, 2016 Tyler Glasnow roster status changed by Pittsburgh Pirates. July 23, 2016 Pittsburgh Pirates recalled RHP Tyler Glasnow from Indianapolis Indians. July 8, 2016 Pittsburgh Pirates optioned RHP Tyler Glasnow to Indianapolis Indians. July 7, 2016 Pittsburgh Pirates recalled Tyler Glasnow from Indianapolis Indians. March 14, 2016 Pittsburgh Pirates optioned RHP Tyler Glasnow to Indianapolis Indians. November 20, 2015 Pittsburgh Pirates selected the contract of Tyler Glasnow from Indianapolis Indians. August 1, 2015 RHP Tyler Glasnow assigned to Indianapolis Indians from Altoona Curve. June 26, 2015 RHP Tyler Glasnow assigned to Altoona Curve from West Virginia Black Bears. June 19, 2015 RHP Tyler Glasnow assigned to West Virginia Black Bears from Altoona Curve. May 20, 2015 Altoona Curve placed RHP Tyler Glasnow on the 7-day disabled list. April 6, 2015 RHP Tyler Glasnow assigned to Altoona Curve from Bradenton Marauders. January 9, 2015 Pittsburgh Pirates invited non-roster RHP Tyler Glasnow to spring training. April 25, 2014 Bradenton Marauders activated RHP Tyler Glasnow from the 7-day disabled list. April 2, 2014 RHP Tyler Glasnow assigned to Bradenton Marauders from West Virginia Power. April 2, 2013 RHP Tyler Glasnow assigned to West Virginia Power from Jamestown Jammers. September 3, 2012 RHP Tyler Glasnow assigned to State College Spikes from GCL Pirates. August 9, 2011 Tyler Glasnow assigned to GCL Pirates from Pittsburgh Pirates. August 6, 2011 Pittsburgh Pirates signed RHP Tyler Glasnow.